Ye hai India Meri jaan. Yahan sb adjust hone ke baad hi chalta hai. Doubtless, you have raised a very relevant issue. "you 'need' a women's coach but you are unhappy about it and when some violator is punished then again you want the punishment to be noble". Do you have a particular solution in mind? ? Anyway, its a very good post. 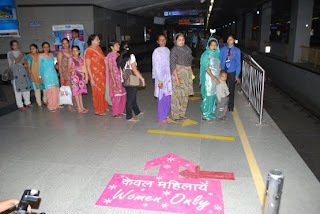 no dear look at it the other way round... we should feel more elated that its only we the women who are so special every where in India... that we have separate seats, lines, coaches.... etc... remember all vip's get this gesture... so consider yourself one of them and take full advantage of ur being a women. Three cheers to womanhood.. hip hip hurray.. hip hip hurray... hip hip hurray!!!!!!!!!! no dear i guess all we women should feel elated and consider the posetive side of it, that its only we the women who are considered so special everywhere in India and get this chance for having special.. seats, coaches, lines etc... remember only the vip's get these special gestures all over the world... so lets give three cheers to WOMANHOOD hip hip hurray... hip hip hurray.... hip hip hurray!!!!! @ Sugat: the point here is not the need of a women coach, but do we really need to segment the two gender? I dont think so! Moreover do you really feel that the offenders should be embrrased like that? I have serious disagreement on this, for a simple reason that each individual's self respect has to be taken care of! By nobel punishment I feel charging 1 grand will be sufficient to stop these men to peep into the women coach. But I am against the concept of women coach only! @ Khayati: Yes!! Three cheers to Womenhood!! Women are special, but why is this speciality segmenting the two genders??? I see it as a move which is socially challenging the society. I would like to first say that even though it would have been socially desirable if women could travel conveniently (i.e. without being bothered by people having 'lack of ethics') in general compartments and a seperate women's coach wouldnt have been required. But creating a women's coach is easier than creating morals or punishing people from the point of view of metro authorities. "It is also financially beneficial to DMRC as more ladies are now willing to travel through metro rather than other means." I agree that this has its own problems. But will a private corporation ever take into account social costs?